The Slash Straight Narwal is a board we haven’t been on in a while. Still, it feels a lot like the old Straight has a similar feel in terms of how the camber profile reacts to the snow but it seems like the materials have changed or were upgraded making the feel a little better overall underfoot. It’s not amazing for a carve for a board of this type but it is a great double ender for those that want a lot of float and not that washy/super surfy back foot feel. Conditions: Pretty good mid-winter conditions with some pretty thick leftover powder. The Slash Straight is from GiGi’s mind and made by Nidecker. Nidecker only really exists in a limited capacity these days in the US but the companies they make boards for like Slash are doing great. The Slash Straightis almost the exact opposite of the ATV and it’s more of a forgiving powder friendly ride. The ride hasn’t changed much over the last couple of years. You know it’s not that much different than past years except it comes in wide. Still the same kind of ride that we really like in powder while at the same time it’s pretty good on groomers as well. Very quick turning and easy floating. You could easily call this a forgiving freeride board or a powder board. It’s very directional and set back with the shape and camber profile but the nose and tail are still the same width where most Powder to Freeride boards have a tapered tail. So it gives it a unique feel that’s surfy and slashy but with a little double ender aftertaste. Conditions: Good soft sierra snow with a little left over powder but far from a pow day. The other days were groomer days with hard to good snow. 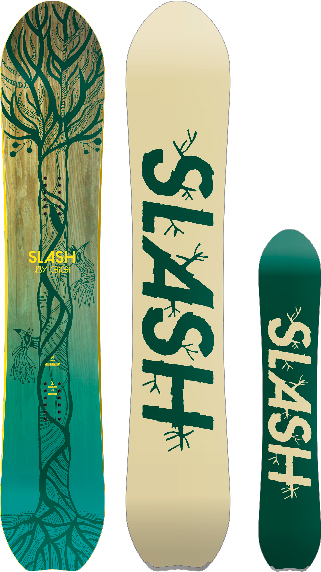 The Slash Straight and YES Pick Your Line share the same type of mellow magnetraction side cut. They also have the same set back length but from there things are a little different. – The Straight has a much more directional shape. The nose and tail are much more different with the Straight. – The nose is super pointy and the tail is almost like a fish tail from a surfboard. -There is also more rocker and less camber in the Straight than the PYL. – The Slash isn’t as thick at the waist as the Yes PYL. The directional shape is a little more suited for getting surfy in the powder than the YES Pick Your Line. They are both surfy but this is a little more surfy. The extra rocker in the nose makes for a more easy float than the PYL even though both are excellent in powder. The PYL is more of a balanced board between Groomers and powder where the Straight is more of a powder board that can ride groomers well. On Snow Feel: It’s stable and feels like you are riding a smaller camber board on groomers but a bigger rocker board in powder. It’s very catch free and forgiving. Powder: I didn’t have a true powder day yet and it wasn’t the best winter for it. I did have some soft left over snow that took a lot of work to find. Even this thick wet left over sierra slush was no problem for the Straight. You can tell that this will have super easy incredibly effortless surfy powder float. Turn Initiation and Carving– Very quick edge to edge for shot radius turns and it doesn’t require much work. Its a very off the back kind of surfy ride that some love. Wider radius turns are ok and so is carving but it can get a little washy. It doesn’t have much camber between the feet and I’d like to see a little more to give it a little more spring out of the carve. Speed: The base needs to be kept up and waxed well. If it’s kept up well it has a good glide for flats but it just glides ok out of the rapping. It just didn’t have the speed of the bases that the Jones or even the YES boards out there had. It doesn’t chatter that much for a board with so much rocker. It’s got all the speed you need for good powder riding and surfy groomer riding. Uneven Terrain: Super easy to deal with bumpy crappy snow that you often have to go through to make your own tracks. It’s fine negotiating the end of the day snow on a crowded groomer day too. 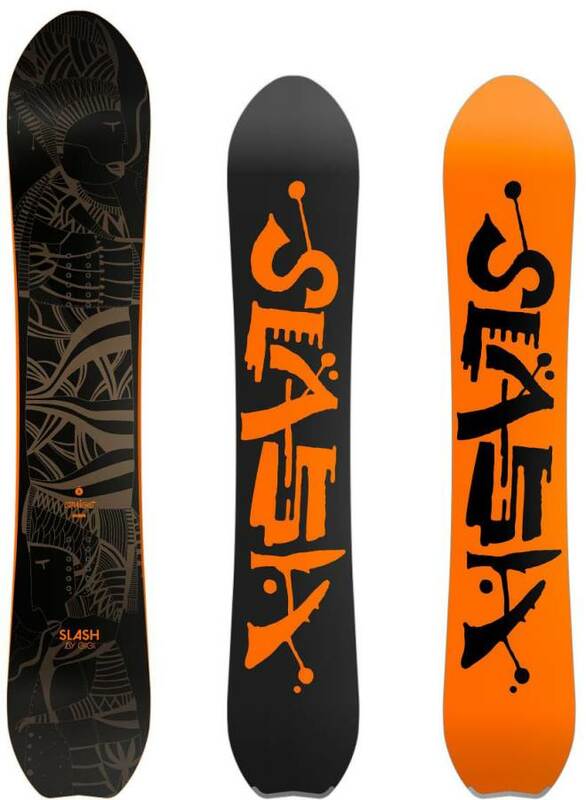 Combine this with a damp pair of bindings and you will feel little shock when you are in crappy slow speed snow. Edge Hold: Very smart to add the Ultimate Traction bumps to the board. Its not grabby in thick soft snow but it holds in harder snow as well. It’s not an ice specialist though. You will want something with magnetraction for that. Flex: Right there in the medium world. It’s not bad to butter and press but that’s not really this boards best feature. All in all this is a pretty fun board for those that want a super easy float in powder and need something that can perform rather well on groomers when it’s not dumping. We try to get as many images of the Slash Straight Narwal, but forgive us if they're not all there. 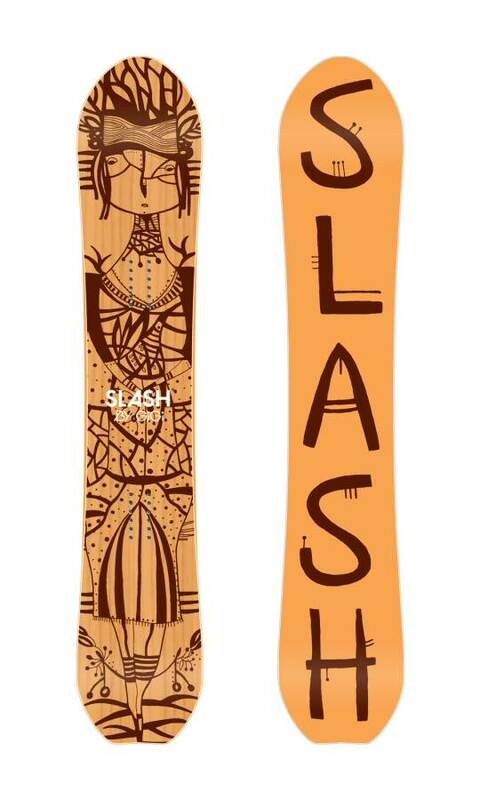 This is the second SLASH snowboard i have bought and is, again, one of the best boards i've ever ridden. This board is very smooth feeling and likes to go very fast. You can link together turns better than anything i've ever ridden. The flex is great and tail offers some great pop for a free ride board. As with other SLASH boards...this is the lightest board i've ever been on and the durability seems to be great. The 161 is a good choice, i think you might want to size up to get the most fun out of this board. I live in the PNW and this board is great for our deep days. Rides great, easy to turn, nice and stable, floats in the pow, can hold an edge alright. FAST! Can't say enough good things about this board. Love it! I first heard about this board from TWSnowboarding's Good Wood review. I decided to get it knowing that it wasn't going to be the only board I was going to pick up this winter. While it is most at home in the deep stuff, going fast, based on some other reviews I had read I felt comfortable enough trying it out on the groomers that we have here at Sugarloaf Mountain. Being an east coast rider, while we can get dumped on, it is more common to find groomed runs than knee deep powder. This board is as advertised. It LOVES to do exactly what it says, go straight and fast. Early in the season we had a great amount of deep fluffy snow and this board ripped it up. With the setback directional stance it was nice not having to camp out on my rear leg. The rocker outside of the bindings helps with the lift. For deep stuff I highly recommend this board. As the season has worn on and the snow has turned to the usual hard east coast stuff this board has changed a bit in my mind. It does handle hard groomed surfaces well, but probably not the best out there for those conditions. The camber is pretty mild between the feet and could probably be a bit more aggressive in my opinion. The tail is super stiff, which I personally like. If you keep your weight back just a bit, it gives a nice surfy ride that still can hold a decent edge and gives you confidence at high speeds. You can ride switch with this board, even with the directional stance on it but it not a great ride on the hard stuff with that much of a tail. The one knock I really have with this board is that the top sheet is super fragile. Granted, as a snowboard coach it takes it's share of dings, but even before my coaching season fully got started it seemed that the edges were constantly getting dinged, either from banging into the chair lift, small trees in the back country, or even the loading and unloading in my van. The graphic and colors are awesome and I've gotten a lot of compliment, I just wish it was more durable. Overall, I recommend this board. It can be your only board if you like going fast and either have lots of snow, or just live for those few days a year that make the summer tolerable. If spending the day in the park is what riding is about, then this isn't your board, but if you appreciate a board that can handle the steeps and the deeps you will be happy, as in very happy. If you have a fun playful board that you can butter and jib with then this would be an excellent addition to your quiver.